Little Vine Vineyards makes it easy to be a loyal customer! Joining our wine club grants you special discounts & invitations to exclusive events throughout the fiscal year. To sign up all you need to do is purchase the initial amount of bottles for the level of your choice. You also must put a $30 deposit down that will pay for the last bottle required for your membership. Over the year, (a 12-month period) you must purchase the remaining bottles needed for the level of your choice. 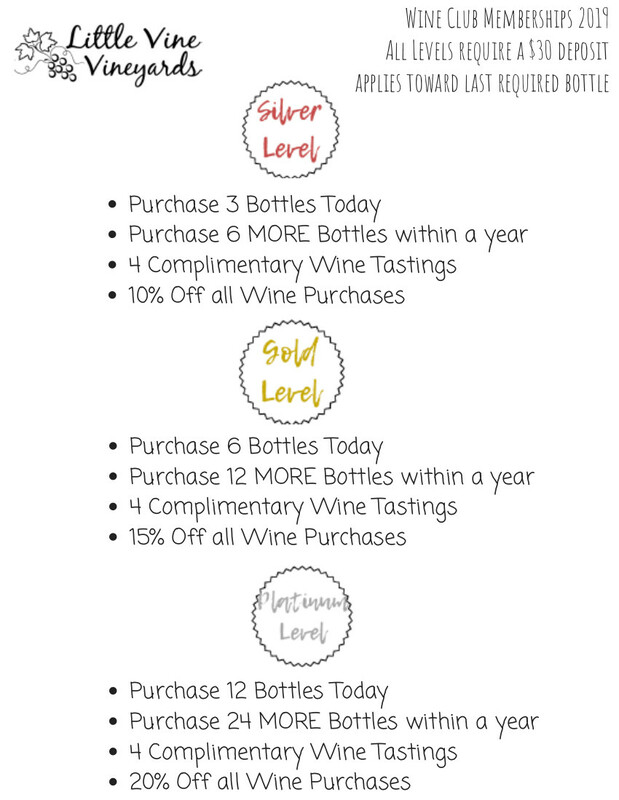 For example, Silver Level requires a purchase of 3 bottles on the day you signup and then an additional $30. Throughout the year it requires you purchase another 6 bottles, because of your deposit the last bottle is already paid for. As a wine club member you also get 4 complementary tastings. You, as a member cannot use the tastings, but bring your friends or family and they get a tasting on you! Copyright © 2019 Little Vine Vineyards. Website By: Open Source Technologies.